... by sewing up some of my stashed patterns! I really want to buy some (or all) of the new Oliver + s patterns. But in order to justify that purchase, I decided I really needed to sew up a couple of the nine (or ten? eek) o+s patterns in my stash which I haven't tried yet. First up, I decided to try the 2+2 blouse and skirt. I have wanted to make this blouse forever. I don't know why I took so long - too many projects and not enough time! I dug deep into the stash and found this adorable brown and orange print. Man, I have a ton of this fabric. It's a little hard to choose projects for because of the stripey nature of the print. I cut this blouse out on the cross grain so that the stripes would go vertically instead of horizontally, which I like a little better. I also happened to find a matching brown solid in my "toss" pile - it's a poly/cotton blend, which makes it no good for quilting, and I didn't think I had enough for anything else, but I had plenty for some bias strips and the little patch. Yay for stash sewing! I decided to bind the short sleeves in bias instead of folding the bias entirely to the inside, and I'm so glad I did. 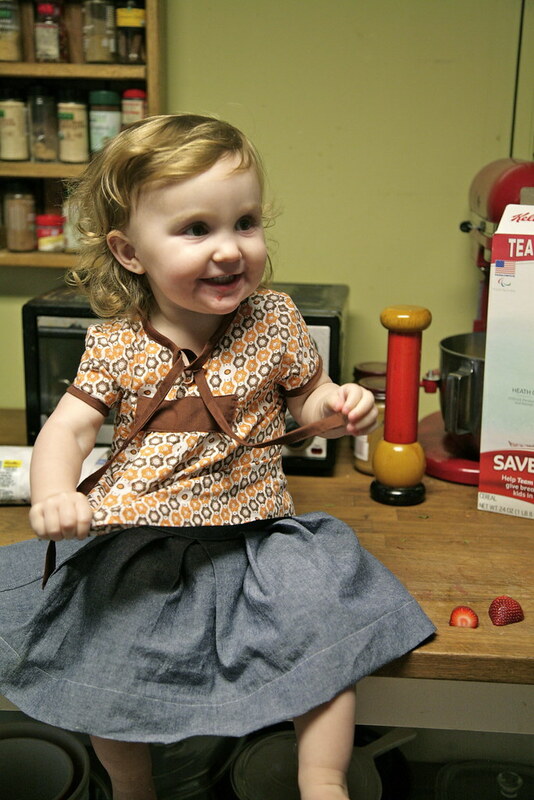 I squeezed the skirt out of less than a half yard of chambray, using my very last scraps of this much-used piece. It's crazy - everything looks beautiful done up in chambray! It's like a basic law of sewing or something. 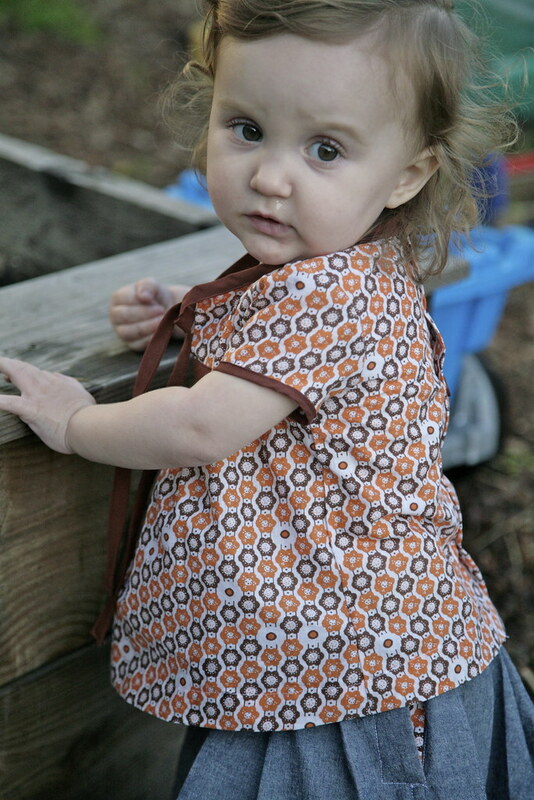 As you can see in the photo above, I snuck a little more of the orange print into the little side placket. I still need to sew the snaps on the placket to keep it shut while Maggie is moving around. Maggie looks so good in brown, doesn't she? I know these are not colors you would ordinarily expect to see on a toddler, which is one reason I love sewing with them so much. I measured Maggie before cutting and I'm glad I did. She measures 6-12 months in the chest, and 18-24 months in length. I ended up making these in 12-18 months with a little extra length (only an inch or so) in the blouse. Maggie is such a tiny peanut. It's funny - Joe was a giant hulking baby and he's still a pretty big guy. He weighed more than Maggie does at 20 months when he was 8 months old! Maggie, on the other hand, is less than tenth percentile for weight (but she's still chubby, so we're not at all concerned that she's not well nourished). Both of these kids have the same parents, and both of them drank from the same breasts. Joe has always eaten like a bird, whereas Maggie eats everything in sight. What happened? Genetics are so fascinating. The advantage to having a tiny little baby like Maggie is that she takes a long time to grow out of my lovingly made homemade garments. The disadvantage is that her drawer is already full of clothes, and I don't have an excuse to make more! This is an excellent pattern, of course. I expect nothing less from Oliver + s. Going in, I figured it would be dead simple, but there is a pleasing amount of complexity to the construction of both the skirt and blouse. That's not to say it's difficult - it is clever. I learned some things. The way the gathers in the front are folded into a little seam on the outside, and then covered with the front patch is so genius! Too bad I didn't read the instructions carefully enough and kind of messed it up. Oops! Next time I will follow Nicole's excellent tutorial and it will look much neater inside. Take it from me, folks: It pays to actually read the instructions. 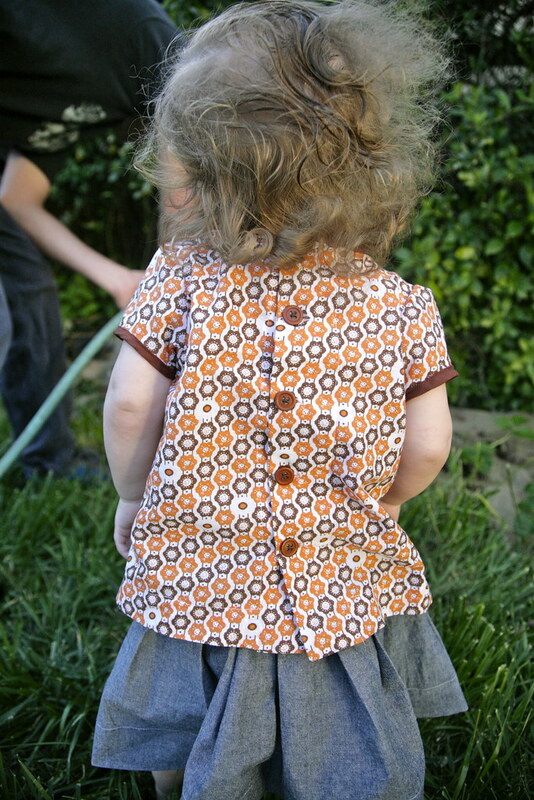 Sweet buttons down the back. A pleated skirt is probably not the most practical garment for a 20 month old who is constantly running and climbing and jumping on big wheels, but the little combination is blindingly cute, right? 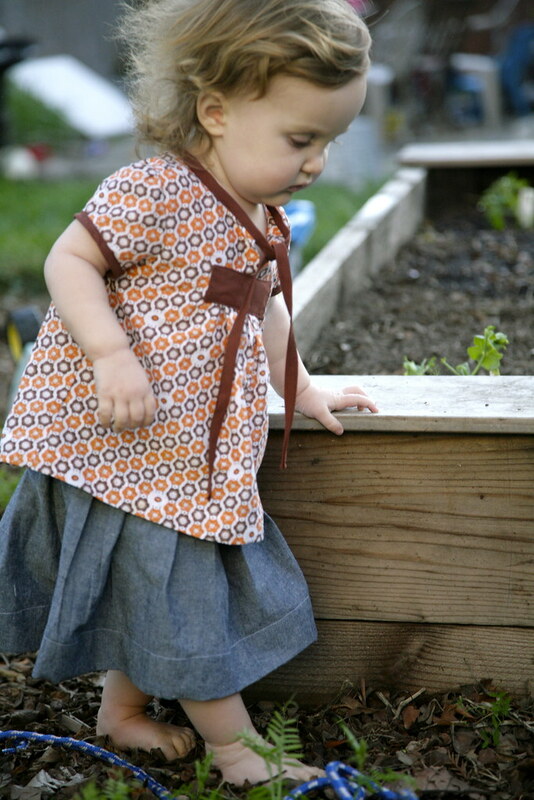 I made the hem deep and the elastic on the loose side - I am hoping she will be able to grow into it a bit. Again, the skirt seems so simple, but that little side placket is adorable and just challenging enough to construct to keep the process interesting. This is a great skirt for an older girl - I am looking forward to trying it for my little niece Helen. 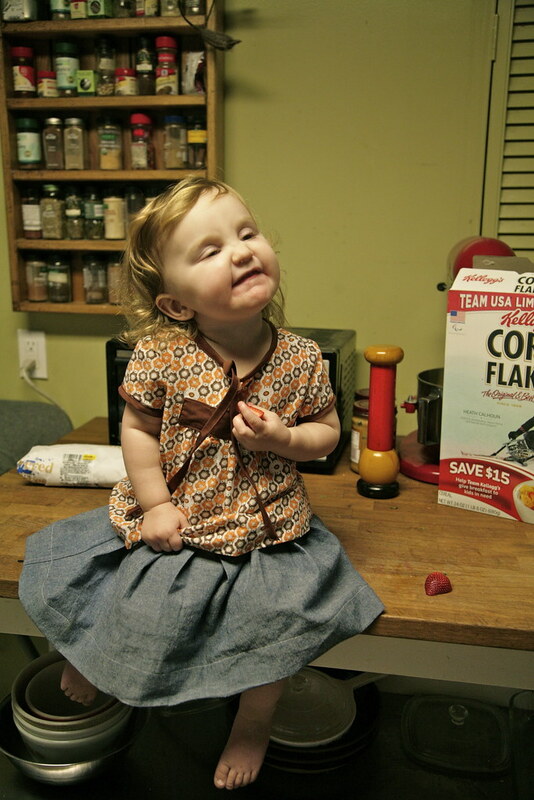 Maggie loves to sit up on the kitchen counter while we work. Of course, we adults are nervous the entire time that she might fall, but Maggie is absolutely delighted. Here she is saying "No!" when asked whether she wanted to get down. "No!" is Maggie's favorite word, but it's certainly not her only word. She's learning more words every day, it seems. Lately, she's saying up, down, milk, Joey, duck, doggy, "moo," "meow," yummy, poo-poo and pee-pee (ha! ), and baby. And lots of others I'm not remembering right now. It is not possible to witness Maggie calling her doll "baby" without absolutely melting with the cute. Oh, Miss Margaret. You are such a delight. Hey, my arugula is totally going to seed as well! :-) Yes, I know you're right! 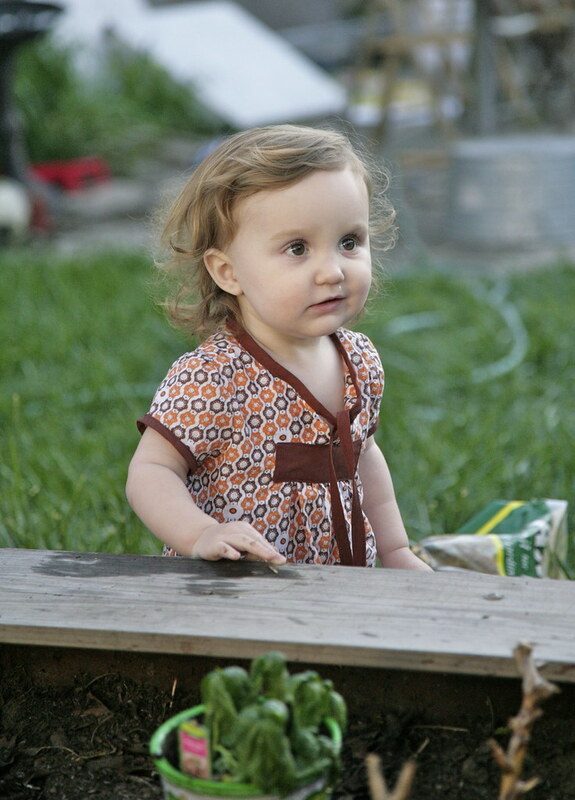 Don't grow TOO fast, baby Maggie! Doesn't it feel great to sew from the stash? It's like you made somethimg out of nothing. Magic! This outfit is just adorable! I agree with you on the binding on the sleeve...I love that detail! And a little pleated chambray skirt? What could be cuter? Exactly! Since fabric that has been lingering in the stash so long that I can't remember how much it cost is "free" - and so are patterns - this outfit cost me NOTHING! Awesome! Love the outfit, Inder, and Miss Maggie is totally adorable. It happened almost by accident - I didn't read the instructions closely at first, so I assumed it would be binding rather than facing, and when I got to that part later, I was like, I want it to be a binding! Lucky accident. Haha! So close to my experience! And yet, my sister's little baby girl is a giant chubster, so I know it's not just a boy/girl thing! But I joked when Joe was a baby that I lost a pound for every pound he gained, and he gained the pounds quickly! So that was nice. That hasn't been true with Maggie, so maybe there was something to that analogy! Who knows. We have our share of "flying" off chairs and footstools around here, too, but so far Maggie has been good about staying put on the counter! Eeek. She better stay that way! Dear little Maggie!! And the outfit is so stylish! Thank you! She is so dear. And she'd be stylish in a paper sack. Like, really. What's better than brown on a little girl? Brown with orange and chambray! Gorgeous. My thoughts exactly!!! Can't go wrong with orange, brown, and chambray! aw, maggie! she's so classically cute. oh those curls! and that outfit is darling on her. i love the colors you chose, Inder. they work perfectly together! and great job sewing from your stash! Yes, my kids are definitely blessed in the curls department! They get that from dad (although my hair is a bit wavy). Thank you, and yes, I feel so virtuous! Can I buy more fabric now? Haha. Seriously, I need to stop buying 4 yard cuts of prints (I haven't in years, actually, but I still have so much from the past!) because it takes FOREVER to get through them and I get so sick of them! So much to love in this post. Maggie looks awesome in brown, I make Tildy a lot of gear in grey because I think it looks so great on her. Love the 2+2 so much and you have made a gorgeous version. Totally agree about chambray/denim, everything looks good in it. And yay for tiny healthy babies, Matilda is one of my first to MAKE it to the 10th percentile, and you have seen my biggies. THis is such a great set of photos and gorgeous sewing as well! What a great little outfit! And hooray for using what you've got. I'm on a similar mission for both patterns and fabric. 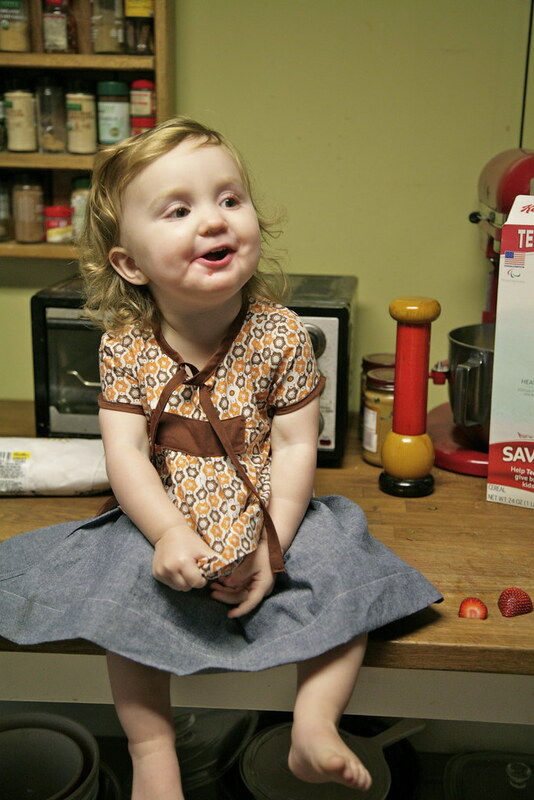 I love the print and the chambray and Maggie is adorable. At first I thought that placket was a little side pocket you'd added!